We went to Souplantation for dinner tonight. Early even - kinda like elderly people do. What can I say, Todd and I lead a wild-n-crazy life! In other news... today I discovered my burger-loving self was featured on the Little Dreamer Designs blog! They didn't tell me, so it was quite a surprise. (Thanks Lisa for pointing it out to me too!) We have a new person on staff at LDD, Tracy, who is putting up regular blog posts with layouts, product features, CT features, challenges, etc. She's doing a fantastic job. congrats that your page was featured on the LDD blog. That´s great!! It was a really fantastic page! I saw your layout at LDD earlier today. I loved that layout. Congrats on having it featured on the blog. And we always eat early. We're old people too. Congrats to the LO's at LDD! You really have a distinct style, and your LO's are always fun to watch. Looks like a yummy vegetable row! 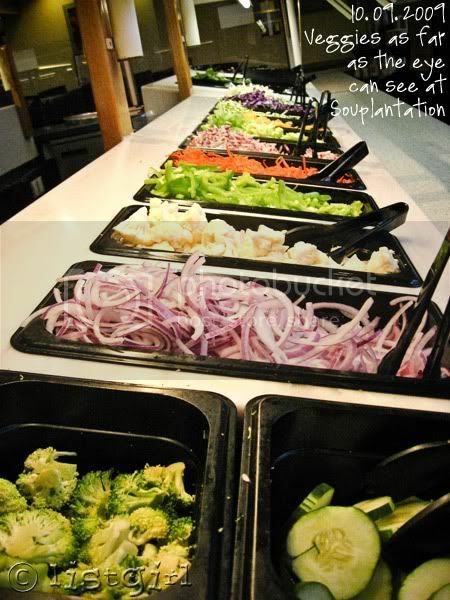 I love Souplantation (aka Sweet Tomatoes)... I can't wait til they come to my neck of the woods. Should They Have This Much Fun At Work?